(Minghui.org) More than 1,000 Falun Gong practitioners gathered in front of the Consulate General of China in New York on July 20, 2016, to call for an end to the 17 years of persecution by the Chinese Communist Party (CCP). More than 1,000 Falun Gong practitioners held a rally in front of the Consulate General of China in New York. Dr. Li Tianxiao, a political analyst, said during his speech, that instead of yielding, Falun Gong practitioners had exposed the persecution to people in all circles of life using various means around the world. Their banners and activities have been visible in places from Tiananmen Square, to the Chinese embassies and consulates, to every country, and that their seemingly ordinary appeals have shown unprecedented bravery. Dr. Li stressed that Falun Gong has miraculously displayed a peaceful resistance to the persecution, and behind the miracle was a simple word, faith. He said it was the faith of practitioners that made them able to endure torture, to turn the hardest situation around, and to free hundreds of millions of people from the CCP, and that their strong faith in Truthfulness-Compassion-Forbearance made them invincible. Dr. Wang Zhiyuan, president of World Organization to Investigate the Persecution of Falun Gong (WOIPFG), spoke at the rally. He said, “The CCP’s persecution of Falun Gong is genocide and a crime against humanity under the direction of Jiang Zemin. 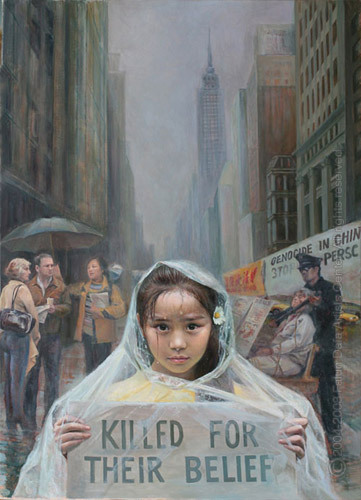 Organ harvesting from living practitioners, and tortures using psychiatric means, are the most evil crimes in history.” Dr. Wang also pointed out that many of the chief perpetrators have been arrested, one after another, and the same ending is approaching Jiang Zemin, Zeng Qinghong, and Luo Gan. He warned that the countdown to the day of the CCP’s collapse has started. Falun Gong practitioners Mr. Tang Zhiheng, Ms. Li Dianqin, and Mr. Yang Xiaoping recounted the persecution they personally experienced in China. Mr. Tang has been arrested eight times, thrown into a forced labor camp for two years, and prison for four and an half years. Ms. Li was tortured in mental hospitals twice, imprisoned in Masanjia Forced Labor Camp for a year, and in the Women’s Prison of Liaoning Province for three years. Mr. Yang was arrested twice for appealing for Falun Gong. He was also imprisoned, and his home was searched by police. Falun Gong practitioners’ candlelight vigil in front of the Chinese Consulate in New York marks 17 years of peaceful resistance to the CCP’s brutal persecution. (Minghui.org) The award-winning documentary Hard to Believe, which exposes the state-sanctioned organ harvesting of persecuted Falun Gong practitioners in China, premiered at the Hoboken International Film Festival in New York City on June 4. Directed by Emmy Award winner Ken Stone, this in-depth investigation made a profound impact on the audience at the Paramount Theatre. After the screening, people talk to the producer, asking for more information about the persecution of Falun Gong in China. According to one of the documentary’s producers, Kay Rubacek, the response from the VIP screening on June 3 was enthusiastic, and the public screening the next day was so well attended that the theater had to add extra seats. Ms. Rubacek explained the reason for making the film: “This is such a serious crime that the world hasn’t been paying enough attention to. In the film, we don’t only investigate the crime to prove that it is happening […], we investigate the next step, which is why so few people are paying attention, and that is even more shocking. “This has been going on for so long. [audience members] have been crying after watching the film.” She added that some viewers have expressed remorse for ignoring Falun Gong practitioners who hand out flyers on the street to raise awareness of the brutality of the persecution. “This human rights violation is among the greatest of atrocities. The people who are doing this are evil doctors. It’s like the Nazis; I can’t believe what I just saw on the big screen. I want to join the campaign and spread the word and help make a difference,” said Ms. D’Agostino. Penny Stoil (second from left) compared the persecution of Falun Gong to Nazi crimes. Audience members of all ages and backgrounds were stunned by the crimes taking place in China. Many of them signed the petition calling for the end of forced organ harvesting, and some talked to Falun Gong practitioners after the screening for more information on the persecution. Deb Wendolousky from Rhode Island commented that it was an outrage for 65,000 people within a year to have their organs harvested while they were still alive. She called on those who need transplants not to obtain organs from China. “All lives are equally important, and one should not be killed to save another,” she said. (Minghui.org) Recently, eleven New York City council members proclaimed World Falun Dafa Day, honoring Falun Dafa’s core principles of “Truthfulness, Compassion, Forbearance” and commending Falun Dafa practitioners for their contribution to the community. Mr. Mark Levine, representative of District 7, proclaims Mr. Li Hongzhi “Outstanding Citizen” for giving exemplary service to the communities. Letter from Mr. Paul Vallone, representative of District 19 (Queens) praises Falun Dafa practitioners for their contribution to the community. Mr. Daneek Miller, representative of District 27 (Queens) proclaims World Falun Dafa Day. Mr. Donovan Richards, representative of District 31 (Queens), proclaims World Falun Dafa Day. Mr. Eric Ulrich, representative of District 32, proclaims World Falun Dafa Day. Mr. Robert Cornegy, representative of District 36, proclaims World Falun Dafa Day. Mr. Jumaane D. Williams, representative of District 45 (Brooklyn), honors Falun Dafa Day. Mr. Alan Maisel, representative of District 46 (Brooklyn), proclaims World Falun Dafa Day. Mr. Joseph Borelli, representative of District 51 (Stanton), proclaims World Falun Dafa Day. (Minghui.org) During the celebration of the 17th World Falun Dafa Day in May 2016, a total of 103 greetings and proclamations were received from government officials of different levels in the State of New York. They praised Falun Dafa’s universal principles of Truthfulness, Compassion and Forbearance, and the benefits the practice has brought to more than 100 million people around the world. In addition to the NewYork State Senate Resolution 4090, sponsored by Senator Jack Martins, which proclaims May 13, 2016 as Falun Dafa Day, State Senators from the 3rd, the 4th, the 42nd and the 55th districts issued greeting letters and proclamations for the occasion. (Minghui.org) Nearly 10,000 Falun Dafa practitioners from over 50 countries paraded in New York City on May 13, 2016 to celebrate the 17th World Falun Dafa Day. The Divine Land Marching Band led the three-and-a-half-hour parade across Manhattan’s 42nd Street, from the United Nations on the east side, through Times Square, to the Chinese Consulate on the west side. The parade was comprised of three sections: introducing Falun Dafa, stopping the persecution in China, and supporting the 230 million who have quit the Chinese Communist Party (CCP) and its youth organizations. A middle-aged tourist from Beijing said he had watched the parade for a long time and was moved by its tremendous scale. Yet he had only seen part of the first section. Practitioner Jorge Gimeno from Spain said he found the answers to many questions about life in the book Zhuan Falun. Jorge Gimeno has come to New York City every May since he took up the practice of Falun Dafa in 2010. He enjoys meeting so many fellow practitioners and hopes that more people will come to appreciate the beauty of Falun Dafa from the grand parade. “My whole life changed after I practiced Falun Dafa,” Gimeno said. He had been wondering why some people have almost everything and are happy and many others have very little and are unhappy. He had been looking for happiness for years, and says that Falun Dafa gave him the answers he was looking for. He noticed that many Chinese people still don’t know the truth about Falun Dafa because of the negative propaganda from Chinese state-controlled media. “If they open their hearts to embrace the truth about the practice and return to traditional culture, they will find peace in their hearts and experience the beauty of Falun Dafa,” he said. Swedish practitioner Barbro Plogander feels lucky that she encountered Falun Dafa 10 years ago. She had been experiencing a very difficult time in her life and had fallen into deep depression. Practicing the exercises brightened her life, lifted her out of depression and filled her heart with confidence and energy to deal with life and work. Ms. Zheng heard of Falun Dafa and attended the experience sharing conference in Singapore in 1998 where she met Teacher Li Hongzhi. Practicing Falun Dafa, she regained her health and let go of negative thoughts. She now regards it as her duty to participate in the parade to show the merits of Falun Dafa to the world. “Falun Dafa changed my life for the better. I feel very much alive now, completely different from the past,” said Amparo Ambia. “Teacher taught us to look at life from a different angle, a higher level. I am very thankful,” she added. Ms. Minerva Cruz is a finance clerk working for the Dominican government. Her younger brother received a Falun Dafa flier from someone on the street and took it home. She saw the flier and was very interested in it. She later saw a Falun Dafa booth at a Book Expo and learned the exercises. Her family quickly noticed the changes in her because she used to be a very emotional person. “My family supports me and my brother practicing Falun Dafa. My parents also help with some Dafa related projects, too,” said Minerva. Juan Pablo Boschi (left) and Merleders Gambini, a couple from Argentina. Juan Pablo Boschi has practiced Falun Dafa for 6 years. He quit smoking and enjoyed improved health of both mind and body soon after starting. “I know that many Chinese people live in a communist party culture and they have taken in much propaganda. I hope they can listen to what Falun Dafa practitioners say and read some materials about it,” said Boschi. (Minghui.org) As a part of the celebration of Falun Dafa Day last week, groups of practitioners from all over the world did the Falun Dafa exercises in New York City’s parks, including Central Park, Bowling Green Park, Battery Park, and Cadman Plaza Park. Practitioners do the Falun Dafa exercises in Central Park, Manhattan. The beautiful scene and peaceful energy interested many tourists and local citizens. Some people stopped and watched, some asked for more detailed information of the local exercise sites, and others learned the exercise movements. Marjoram Allen learned the Falun Dafa exercises in Central Park. Marjoram Allen from California has been practicing Tai Chi. She saw practitioners doing the Falun Dafa exercises near an entrance of Central Park on 7th Ave.
“This practice is more gentle,” she said. “I like it very much. I can enjoy the peacefulness. The energy field is beneficial.” Marjoram says she wants to continue practicing once she gets home. One woman was surprised to see practitioners doing the exercises everywhere in Central Park. She said she could feel the energy field and asked for detailed information. After a practitioner played a six-minute introductory video on a cell phone, the woman wanted to learn the exercise movements right away. She said that her mind was occupied by the characters “Dafa” when learning the exercises. The practitioner who taught her the movements gave her a copy of Zhuan Falun(the main book of Falun Gong). Gaanthiligge’s family wishes practitioners good luck. Rich, a college instructor, was impressed by the practitioners’ march in Manhattan on May 13. He saw groups of practitioners meditating in Central Park the next day, which drew his attention and made him want to learn more. He said he likes the spiritual component of Falun Dafa and asked practitioners to demonstrate the exercises for him. He indicated that he would tell what he learned to his students.